It's all About Balance- Pond Balance. Pond Aeration. 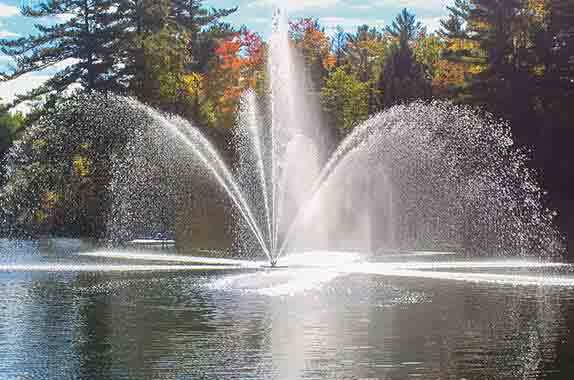 Oxygenation: A great aeration system easily adds oxygen back into the pond/lake. Nutrients: This has a direct impact on the aquatic ecosystem. Light & Temperature: As water temperature increases, the water’s capacity to hold oxygen decreases. Every pond or lake is a unique ecosystem and it is very important to understand problems and the cause/effect it has. By increasing and documenting your ecosystem knowledge your will be able to maintain a healthy body of water that will bring you pleasure. Floating surface pond aerators are easy to install and add to your pond. They move large volumes of water with a propeller pump. They help the pond ecosystem by circulating the pond water to minimize or eliminate thermoclines that can impact fish and aquatic life. Surface aerators also add oxygen to the water and can have optional water deflectors to create fountain type spray patterns. They are a high volume low pressure pump to provide maximum circulation so the optional spray patterns of the highest volume models will not be very high. Always ensure that the model chosen is manufactured to CSA and UL standards for safety. The best models will have foam filled floats and stainless steel motors and motor mounts.